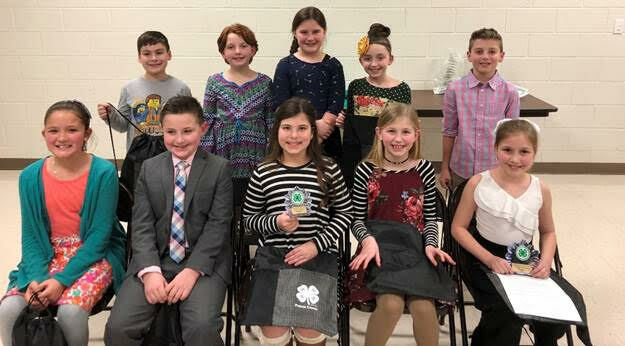 Public Speaking may be one of the top fears in America, but Putnam County 4-H members faced that fear head on as they participated in the county public speaking contest. Winners were selected from local contests in their classrooms and were invited to compete at the county level. The Putnam County 4-H Public Speaking Contest was held Tuesday, January 8th at the TTU Hyder-Burks Agriculture Pavilion. Around 70 4-H members, along with their cheering section of parents, grandparents and other family supporters were in attendance. Participants are judged on the presentation of their speech while using good grammar, pleasing volume and pace, eye contact, and subject matter. Local volunteers and former 4-H members served as judges for the contest. Awards were given to all participants and the top ten were announced. First and second place winners in the 4th – 12th grades went on to compete at the sub-region contest that was held on January 24th at Hyder-Burks Ag Pavilion in Cookeville. The top 5 individuals in the 9th – 12th grades at the sub-region, then competed at the Central Region Contest on February 2nd. 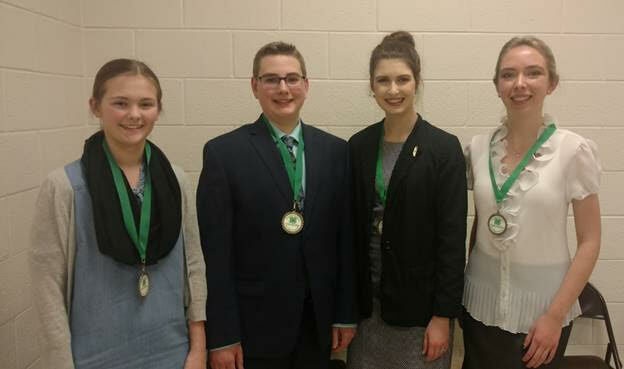 Putnam County was represented by four 4-H members at the Central Region 4-H Sr. High Public Speaking Contest: Bailey Steger and Kayla Mick- 9th grade, Jodi Frye- 11th grade, and Hannah Bernhardt- 12th grade. Thanks to the parents, grandparents, teachers, principals, and all who have encouraged and assisted these 4-H’ers with their speeches. We are very proud of all the 4-H’ers in the county who gave an effort to participate in the public speaking contest this year. Public speaking is one of the most important skills our 4-H members can develop and will enable them to have a strong foundation for future success. Congratulations to everyone who participated this year. Call the Putnam County Extension Office at 526-4561 for further information relating to the many 4-H activities and events available to our great young people in Putnam County. 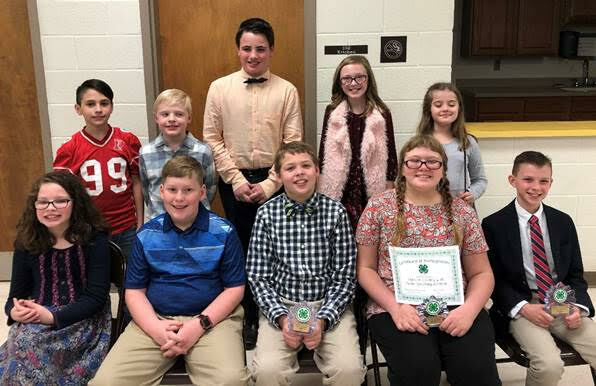 Twenty-three 4th grade 4-H’ers competed in the County 4-H Speech Contest Tuesday, January 8th. Top Ten Winners were as follows, front; R to L: Evey Burchett, Zoey Gentry, Emma Kate Black, Hudson Garrett, and Kalli Patton. Back; R to L: Blake Johnson, Bella Milligan, Michaela Bergstrom, Maggie Smith, and Jackson Witcher. Eighteen 5th graders competed in the county contest. Top Ten Winners were as follows, front; R to L: Lane Garrett, Kiyah Howell, Will McCrary, Nicholas McCloud, and Ellie Kirby. Back, R to L: Shelby Jones, Bonnie Barnes, Brody Parsons, Andrew Ramey, and Alonzo Sanchez. Six 6th graders attended the county contest. L to R: Katie Mullins, Miriam Strahan, Savannah Clark, Gernt Martin, Cain Ealey, and Eliza Eldridge. 7th & 8th grade winners were, L to R: Cadence Howell, Kinley Arms, Tehya Howell, and Britta Gaetjens. 9th – 12th grade competitors included, L to R: Kayla Mick, Bailey Steger, Hannah Bernhardt, and Jodi Frye. All four represented Putnam County well at the Area 2 and Central Region Sr. High Public Speaking Contests.